Join us now for the tale of two cats, hungry not just for stinky salmon treats, but also the intellectual nourishment that comes from contemplating great art. 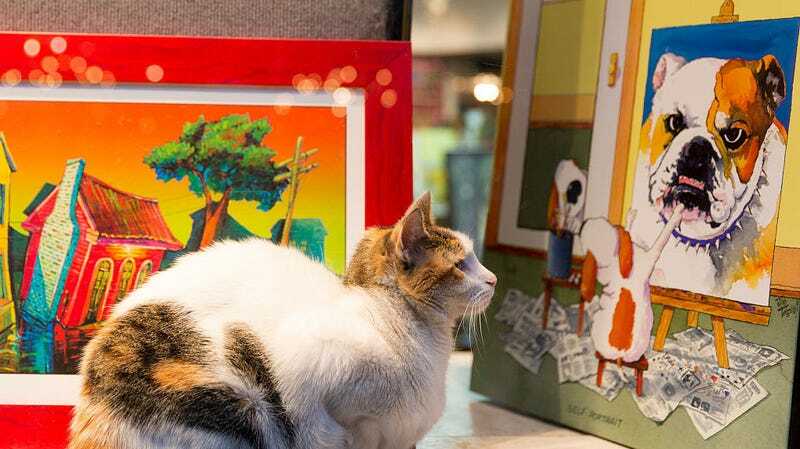 Living in the Japanese city of Onomichi, this pair of feline critics has been trying to gain entry to a local museum only to be stymied, again and again, by security guards unreasonably determined to keep them from expanding their little minds. Pictured above, the two enthusiasts arrive regularly at the automatic front doors of the Onomichi City Museum of Art, hoping for nothing more than to gaze upon the great works that are the heritage of the humans who have domesticated them. They are always stopped, though, by a guard who tirelessly (and mercilessly) bars their entrance, forcing the furry Sisyphuses to continue their toils in never-ending defiance of the building’s animal-barring policies. After having spent the last two years plotting, Ken-chan has returned, bringing along a stripey orange accomplice—Go-chan—whose attempts to sneak into the museum we can only assume are the results of the black cat’s Ocean’s Eleven-style schemes. As of yet, the duo have yet to accomplish their goals, but we can only assume an as-yet-unseen calico is working its way through the museum’s vents, hacking security systems when it isn’t distracted by motes of reflected light or the omnipresent temptation of 14 hour naps. For more of the two delightful little criminals’ work, please feel free to spend an inordinate amount of time perusing an ongoing selection of photos and GIFs from @bijutsu1, a Twitter account devoted to chronicling Ken-chan and Go-chan’s exploits.